No one living can remember the time when the building shown in our first illustration was not already an old landmark in Radnor township. 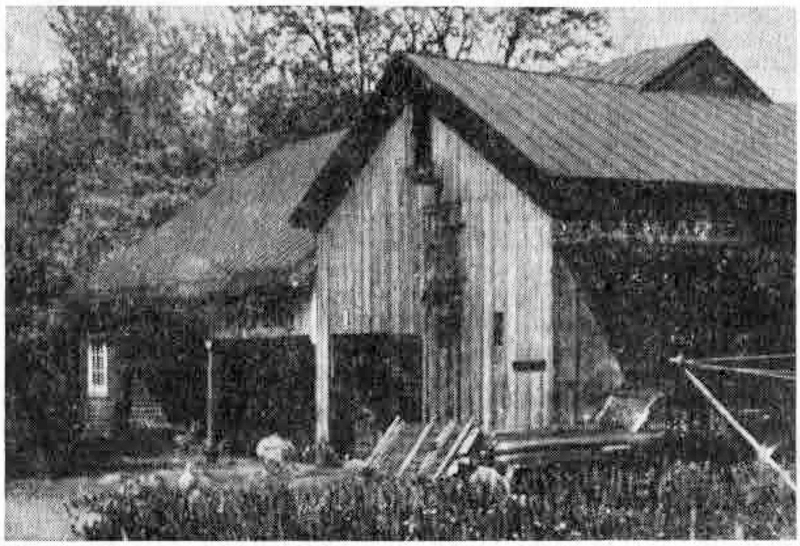 Even before 1800 it stood back of what is now “The Old Store,” on King of Prussia road in Radnor, at its intersection with Belrose lane. In those days the building, later to be occupied by “The Old Store,” was the historic “Red Lion Hotel,” a center of interest and of activity. The area, once known as Morgan’s Corner, was named for the Morgan family, whose ancestor, John Morgan, was among the first of the Welsh settlers to make his home in Radnor township. Old records show that John Morgan was a taxpayer in Radnor township as far back as 1693. He married Mary Davis, daughter of Isaac Davis, of Tredyffrin township, and in 1718 they bought 350 acres of land in this township. Theirs was a large family, many of whose descendants still live in this vicinity. Back in the days of the Red Lion Hotel in Morgan’s Corner, the eastern portion of the old building was used as part of the hotel. The western part of the building was not added until about 1875. It was then operated in connection with the general store, which by this time had succeeded the Red Lion Hotel. At that time, Belrose lane was merely a small private lane, not becoming a public road until some years later. When the western addition was put on the original building, the new roof was built over the old roof, where they were joined instead of removing the latter. Today both roofs are there one on top of the other. Three huge feed bins were built in one room, so that when the grain was dumped on the second floor in unloading, it went by gravity through trap doors into the bins below. There it was shoveled into bags and sold. Other purposes for which the building was used were the storage and sale of hay, harness, farm equipment of all sorts, and dynamite. A well known Morgan’s Corner character called “Dynamite Dan,” who often slept in the hay loft of the building, was reputedly the only one who handled the commodity without fear. 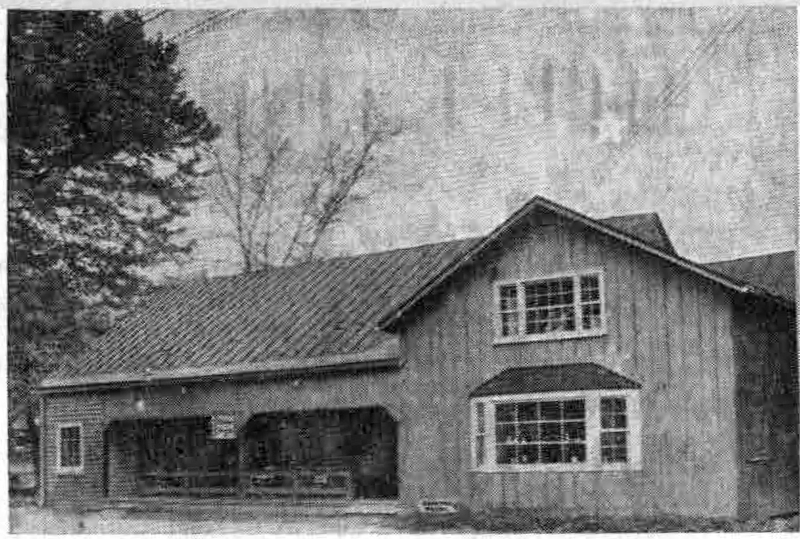 When the feed and grain business was discontinued in the early 1930’s, the upper floor of the old building was often used for barn dances which are still remembered by many who enjoyed these festivities. Otherwise the building was not in active use except for a business in antiques, conducted for a time by Montague Lycett under the name of “The Old Barn.” In the summer of 1952, L. Rodman Page and William B. Thompson, owners of both the Old Store property and the building to the rear, sold the barn to Mr. and Mrs. Paul Thomas, residents of St. Davids. In the space or a few short months these new owners did the picturesque remodeling job as shown in the second picture in this column. Equally attractive is the interior, in which is housed one of the most beautiful as well as one of the most unusual gift shop connections in the Philadelphia suburban area. Pictures and descriptions of it will be given in subsequent articles in this column. Mr. Thomas’ business experience bas been a varied one, including the direction in 1951-52 of part of the technical program of the Economic Cooperative Administration in Washington, now the Foreign Operation Administration. To many this has been more familiarly known as the Marshall Plan. While in Europe for ECA and engaged in stimulating production and in encouraging exports to the United States, the many unusual products that were available excited the interest of both Mr. and Mrs. Thomas. This interest, together with a desire to establish a base of operations near their home, “Sanctuary Hill,” St. Davids, for a business which would also encompass their own desire for foreign travel, led them to establish the shop at “Radnor House.” Here they have imports from Spain, Germany, Holland, France, Denmark, England, Norway, Portugal, and Italy, in addition to many American products.